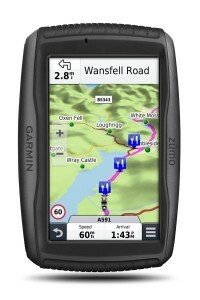 The Garmin Zumo 590LM comes with all the features a motorcyclist desires in a GPS navigation system. With its large five-inch screen display that is also glove-friendly, a rugged water-resistant casing, Bluetooth capability, and ability to work with TOPO maps and off-road tracks, this sat nav unit is definitely a necessity for motorcycle travelers and adventure riders alike. The dual-orientation capabilities on the unit enables its users to utilize wider view by positioning the navigator horizontally, or vertically, in case they wish to view more of the route further ahead. In addition, there is no need to take off your gloves in case you wish to use the screen. This is because it is glove-friendly and highly-sensitive to the touch. You also get to keep the driving map onscreen at all times in addition to displaying added information such as real-time traffic and POI along the route thanks to the new and refined interface that the unit comes with. With the Search Field incorporated on this sat nav, finding addresses and millions of Points of Interest (POI) has been made that much easier. It is as simple as typing what you’re looking for into the Search Field and you will be presented with the requested info. The unit also keeps track of things such as tire changes, tire mileage, oil change , tire pressure, new spark plugs ,chain cleanings plus so much more so that you don’t have to keep track of any of it by yourself. In case you wish to record performed maintenance , date, and mileage, then you can make use of the Service History Log. The unit features Bluetooth wireless technology which enables you talk as you ride minus having to remove your helmet or gloves. This can be made possible when you connect your phone to the sat nav with a Bluetooth-enabled helmet or headset that will facilitate the making of and receiving of calls. 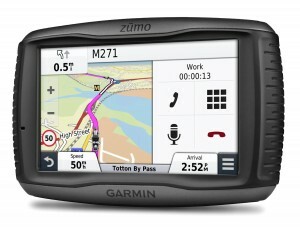 A number of advanced features are also incorporated into the sat nav unit in a bid to make for a memorable navigation. Some of these features include the Active Lane Guidance which makes use of a combination of voice prompts and visual signs to enable users confidently drive through an interchange or exit, the Bird’s Eye junction view provides users with an in-depth view of interchanges, while the photoReal Junction View rationally shows junctions and interchanges along the route, inclusive of the neighboring landscape. In case you love your music, you will be glad to know that this sat nav unit comes with an MP3 player and is compatible with iPod, iPhone and Pandora, to make for a convenient control of your music through the unit’s display. 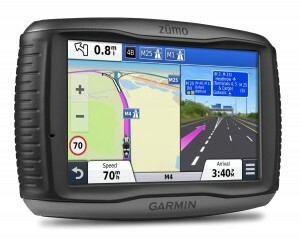 The sat nav unit also incorporates an integrated trip computer with compass display, comes with a digital fuel gauge to make for mile-ride estimates before necessitating a fuel stop and you can also be advised when it is time to throttle time thanks to the speed limit indicator. It also comes with a removable battery, a motorcycle mount, as well as an automotive mount and power cable that can be utilized in a car.